Ukrainian pilot cosmonaut 1996-on. 391 cumulative days in space. Status: Active 1996-on. Born: 1964-06-21. Spaceflights: 4 . Total time in space: 533.14 days. Birth Place: Chardzhou, Turkmenia. PERSONAL DATA: Born 21 June, 1964, in Chardzhow, Turkmenia. Married to Tatiana Mikhailovna Kononenko, they have two children, daughter Alisa and son Andrey, born in 2003. Oleg enjoys reading books, sport games, and spending time with the family. EDUCATION: Graduated from the N.E. Zhukovksy Kharkov Aviation Institute in 1988 as a mechanical engineer. AWARDS: Hero of the Russian Federation (2009), Gagarin and Korolyov pins from the Federal Space Agency, “Prezidentiň ýyldyzy” Order of Turkmenistan, NASA Distinguished Public Service and Space Flight medals. EXPERIENCE: After graduation from the Kharkov Aviation Institute he worked at the Central Design Bureau in Samara as an engineer, design engineer and leading design engineer. 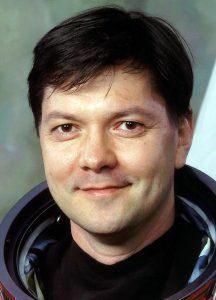 SPACEFLIGHT TRAINING: In 1996 Oleg Kononenko was selected as a test cosmonaut candidate to the Cosmonaut Corps of the Samara Central Design Bureau. From June 1996 to March 1998, he underwent basic cosmonaut training at Gagarin Cosmonaut Training Center and on March 20, 1998, was awarded the title of test cosmonaut by the Interagency Qualification Committee. In October 1998 he began training as part of the group of cosmonauts selected for the International Space Station (ISS) Program. In January 1999 he was assigned to the RSC Energia Cosmonaut Corps as a test cosmonaut. From December 2001, through April 2002 Kononenko trained as a backup flight engineer for the Soyuz TM-34 vehicle for the third ISS visiting crew. From April 2002 through February 2004, he trained as the flight engineer for the Soyuz TMA vehicle and the Expedition-9 and Expedition-11 prime crews. Due to the changes in the ISS program, the ISS crews were reassigned. From March 2004 through March 2006 he trained as part of the group of cosmonauts selected for the ISS Program. From March 2006 to April 2008 Volkov trained as an ISS 17 prime crew commander and Soyuz TMA commander. From December 2009 he has been training as a Soyuz TMA-M flight engineer and ISS flight engineer in the ISS-25/26 backup crew. SPACEFLIGHT EXPERIENCE: Kononenko performed his first spaceflight April 8 – October 24, 2008 as Soyuz TMA-12 flight engineer and ISS flight engineer. During this flight JEM PM of the Kibo module and the JEMRMS manipulator were installed, and ATV-001 “Jules Verne” operations took place for the first time. Kononenko logged 12 hours 15 minutes of EVA time in two spacewalks and logged a total of 199 days in space. PERSONAL DATA: Born June 21, 1964, in Chardzhow, Turkmenia (part of the USSR till 1991). Married to the former Tatiana Mikhailovna Yurieva. Oleg enjoys books, and sport games. His mother, Taisia Stepanovna Kononenko, resides in Chardzhow, Turkmenistan. His father, Dmitry Ivanovich Kononenko, died in 1993. EDUCATION: Graduated from Chardzhow High School, Turkmenia in 1981. Graduated from Kharkov Aviation Institute (KhAI) in 1988 as a mechanical engineer/aircraft engine specialist. While at KhAI he attended the Moscow State Postgraduate courses for managers, engineers and scientists and was qualified as a patent specialist/inventor. In 1989 he graduated from the Kaliningrad Refresher Courses for managers (Moscow Region). In 1990 Oleg Kononenko graduated from the Postgraduate Courses of the Kuibyshev Aviation Institute (Samara) where he specialized in automation of control systems design. SPECIAL HONORS: Best young specialist of the Samara Central Design Bureau (1991). EXPERIENCE: From 1981 to 1982 Oleg Kononenko worked at the Chardzhov aviation logistics enterprise as a technician. After graduation from the Kharkov Aviation Institute he worked at the Central Design Bureau in Samara as an engineer, design engineer and leading design engineer. His responsibilities included design and development of aircraft power supply systems. In 1996 Oleg Kononenko was selected as a test cosmonaut candidate to the Cosmonaut Corps of the Samara Central Design Bureau. From June 1996 to March 1998 he attended basic training and in March 1998 was qualified for flight assignment as a test cosmonaut. Since October 1998 he has attended test cosmonaut advanced training for a space flight to the ISS. In January 1999 he was assigned to the RKK ENERGIA Cosmonaut Corps as a test cosmonaut. In December 2001 Oleg Kononenko was assigned as a flight engineer of the Taxi-3 back up crew. Family: Cosmonaut. Country: Russia, Ukraine. Spacecraft: ISS. Flights: Soyuz TM-34 ISS EP-3, STS-119A, Soyuz TMA-12, Soyuz TMA-01M, Soyuz TMA-02M, Soyuz TMA-03M, Soyuz TMA-17M, Soyuz MS-11. Agency: Kozlov bureau. Bibliography: 12, 5638. 1964 June 21 - . Birth of Oleg Dmitriyevich Kononenko - . Nation: Russia, Ukraine. Related Persons: Kononenko. Ukrainian pilot cosmonaut 1996-on. 391 cumulative days in space. 4 spaceflights, 533.1 days in space. Flew to orbit on Soyuz TMA-12 (2008), Soyuz TMA-03M, Soyuz TMA-17M, Soyuz MS-11..
1999 January 5 - . Energia Engineer Cosmonaut Training Group 14 Supplemental selected. - . Nation: Russia. Related Persons: Kononenko. 2004 January 15 - . STS-119 (cancelled) - . Crew: Fincke, Gernhardt, Kelly, Mark, Kononenko, Lindsey, Noriega, Padalka. Nation: USA. Related Persons: Fincke, Gernhardt, Kelly, Mark, Kononenko, Lindsey, Noriega, Padalka. Agency: NASA. Program: ISS. Flight: STS-119A. Spacecraft Bus: Shuttle. Spacecraft: Atlantis. Flight delayed after the Columbia disaster. STS-119 was to have flown ISS Assembly mission ISS-15A and have carried out a crew rotation..
2008 April 8 - . 2008 April 8 - . 11:16 GMT - . Launch Site: Baikonur. LV Family: R-7. Launch Vehicle: Soyuz-FG. Soyuz TMA-12 - . Call Sign: Eridanus. Crew: Kononenko, Volkov, Sergey, Yi Soyeon. Return Crew: Garriott, Richard, Kononenko, Volkov, Sergey. Payload: Soyuz TMA s/n 222. Mass: 7,200 kg (15,800 lb). Nation: Russia. Related Persons: Garriott, Richard, Kononenko, Volkov, Sergey, Yi Soyeon. Agency: RKA. Program: ISS. Class: Manned. Type: Manned spacecraft. Flight: Soyuz TMA-12, STS-123 ISS EO-16. Spacecraft Bus: Soyuz. Spacecraft: Soyuz TMA. Duration: 198.54 days. Decay Date: 2008-04-19 08:29:00 . USAF Sat Cat: 32756 . COSPAR: 2008-015A. Apogee: 343 km (213 mi). Perigee: 336 km (208 mi). Inclination: 51.60 deg. Period: 91.30 min. Launched the EO-17 long-duration crew to replace the EO-16 crew. The commander was the son of cosmonaut Aleksandr Volkov. Also aboard was Oleg Kononenko (no relation to the 1970's Buran pilot of the same name) and Korean astronaut Yi Soyeon. Soyuz TMA-12 docked at the Pirs module of the International Space Station on 2008 Apr 10 at 12:57 GMT on 10 April. Volkov and Kononenko stayed aboard as the EO-17 long duration crew. Yi returned to earth with the EO-16 crew aboard Soyuz TMA-11. Soyuz TMA-12 undocked on 24 October at 00:16 GMT with the EO-17 crew of Kononenko and Volkov, plus space tourist Richard Garriott, aboard. They landed safely at 03:37 GMT. 2008 April 9 - . ISS On-Orbit Status 04/09/08 - . Nation: USA. Related Persons: Kononenko, Malenchenko, Reisman, Volkov, Sergey, Whitson, Yi Soyeon. Program: ISS. Flight: Soyuz TMA-11, Soyuz TMA-12, STS-123 ISS EO-16, STS-124. 2008 April 10 - . 2008 April 11 - . 2008 April 12 - . 2008 April 13 - . 2008 April 14 - . 2008 April 15 - . 2008 April 16 - . 2008 April 17 - . 2008 April 18 - . 2008 April 19 - . 2008 April 20 - . 2008 April 21 - . 2008 April 22 - . ISS On-Orbit Status 04/22/08 - . Nation: USA. Related Persons: Kononenko, Love, Reisman, Volkov, Sergey, Yi Soyeon. Program: ISS. Flight: Soyuz TMA-12, Soyuz TMA-12 ISS EP-14, STS-122, STS-123 ISS EO-16. 2008 April 23 - . ISS On-Orbit Status 04/23/08 - . Nation: USA. Related Persons: Kononenko, Love, Reisman, Volkov, Sergey, Yurchikhin. Program: ISS. Flight: Soyuz TMA-10. 2008 April 24 - . ISS On-Orbit Status 04/24/08 - . Nation: USA. Related Persons: Kononenko, Reisman, Volkov, Sergey, Yi Soyeon. Program: ISS. Flight: Soyuz TMA-12, Soyuz TMA-12 ISS EP-14, STS-123, STS-123 ISS EO-16. 2008 April 25 - . ISS On-Orbit Status 04/25/08 - . Nation: USA. Related Persons: Kononenko, Love, Malenchenko, Reisman, Tani, Volkov, Sergey. Program: ISS. Flight: Soyuz TMA-11, STS-124. 2008 April 26 - . 2008 April 27 - . 2008 April 28 - . 2008 April 29 - . 2008 April 30 - . ISS On-Orbit Status 04/30/08 - . Nation: USA. Related Persons: Kononenko, Love, Reisman, Volkov, Sergey. Program: ISS. Flight: Soyuz TMA-12, STS-122, STS-123 ISS EO-16, STS-124. 2008 May 1 - . 2008 May 2 - . ISS On-Orbit Status 05/02/08 - . Nation: USA. Related Persons: Kononenko, Love, Reisman, Volkov, Sergey. Program: ISS. Flight: Soyuz TMA-12, STS-123 ISS EO-16, STS-124. 2008 May 3 - . 2008 May 4 - . 2008 May 5 - . 2008 May 6 - . 2008 May 7 - . 2008 May 8 - . ISS On-Orbit Status 05/08/08 - . Nation: USA. Related Persons: Kononenko, Love, Reisman, Volkov, Sergey. Program: ISS. Flight: Soyuz TMA-12, STS-122, STS-123 ISS EO-16. 2008 May 9 - . 2008 May 10 - . 2008 May 11 - . 2008 May 13 - . ISS On-Orbit Status 05/13/08 - . Nation: USA. Related Persons: Anderson, Clayton, Kononenko, Reisman, Volkov, Sergey. Program: ISS. Flight: STS-117 ISS EO-15, STS-122, STS-123, STS-123 ISS EO-16, STS-124. 2008 May 14 - . ISS On-Orbit Status 05/14/08 - . Nation: USA. Related Persons: Kononenko, Kotov, Reisman, Volkov, Sergey. Program: ISS. Flight: Soyuz TMA-10, STS-123 ISS EO-16. 2008 May 15 - . 2008 May 16 - . ISS On-Orbit Status 05/16/08 - . Nation: USA. Related Persons: Kononenko, Reisman, Volkov, Sergey. Program: ISS. Flight: STS-123 ISS EO-16, STS-124. 2008 May 17 - . 2008 May 18 - . 2008 May 19 - . 2008 May 20 - . 2008 May 21 - . 2008 May 22 - . 2008 May 23 - . ISS On-Orbit Status 05/23/08 - . Nation: USA. Related Persons: Kononenko, Reisman, Volkov, Sergey. Program: ISS. Flight: Soyuz TMA-12, STS-123 ISS EO-16, STS-124. 2008 May 24 - . 2008 May 26 - . 2008 May 28 - . ISS On-Orbit Status 05/28/08 - . Nation: USA. Related Persons: Kononenko, Kotov, Malenchenko, Reisman, Volkov, Sergey. Program: ISS. Flight: Soyuz TMA-10, Soyuz TMA-11, Soyuz TMA-12, STS-123 ISS EO-16, STS-124. 2008 June 10 - . 2008 June 11 - . 2008 June 12 - . 2008 June 13 - . 2008 June 14 - . 2008 June 15 - . 2008 June 16 - . 2008 June 17 - . 2008 June 18 - . 2008 June 19 - . 2008 June 20 - . 2008 June 21 - . 2008 June 22 - . 2008 June 23 - . 2008 June 24 - . 2008 June 25 - . 2008 June 26 - . 2008 June 27 - . 2008 June 28 - . 2008 June 29 - . 2008 June 30 - . 2008 July 1 - . 2008 July 2 - . 2008 July 3 - . 2008 July 10 - . EVA ISS EO-17-1 - . Crew: Kononenko, Volkov, Sergey. EVA Duration: 0.26 days. Nation: Russia. Related Persons: Kononenko, Volkov, Sergey. Program: ISS. Flight: Soyuz TMA-12. Inspected the Soyuz TMA-12 spacecraft in an attempt to determine the reason for the failure of the service module to separate on earlier missions, removed a pyrotechnic bolt from the struts connecting the service and reentry modules of the Soyuz for examination on earth, and installed a docking target for the future Russian Multipurpose Research Module. 2008 July 15 - . EVA ISS EO-17-2 - . Crew: Kononenko, Volkov, Sergey. EVA Duration: 0.25 days. Nation: Russia. Related Persons: Kononenko, Volkov, Sergey. Program: ISS. Flight: Soyuz TMA-12. Installed a docking target on the Zvezda service module and the Vsplesk experiment. Straightened a ham radio antenna and retrieved a Biorisk cannister..
2010 October 7 - . 23:10 GMT - . Launch Site: Baikonur. Launch Complex: Baikonur LC1. LV Family: R-7. Launch Vehicle: Soyuz-FG. Soyuz TMA-01M - . Call Sign: Ingul. Crew: Kaleri, Kelly, Scott, Skripochka. Backup Crew: Garan, Kononenko, Volkov, Sergey. Payload: Soyuz TMA s/n 701. Mass: 7,200 kg (15,800 lb). Nation: Russia. Agency: RKA. Program: ISS. Class: Manned. Type: Manned spacecraft. Flight: Soyuz TMA-01M. Spacecraft Bus: Soyuz. Spacecraft: Soyuz TMA. Duration: 159.78 days. Decay Date: 2011-03-16 . USAF Sat Cat: 37183 . COSPAR: 2010-052A. Apogee: 355 km (220 mi). Perigee: 350 km (210 mi). Inclination: 51.60 deg. Period: 91.60 min. ISS EO-25 crew. The Soyuz docked at the Poisk module of the ISS at 00:01 GMT on 10 October. The crew entered the spacecraft and undocked at 04:27 GMT on 16 March 2011. Following retrofire and re-entry they landed safely in Kazakhstan at 07:53 GMT..
2011 December 21 - . 13:16 GMT - . Launch Site: Baikonur. Launch Complex: Baikonur LC1. LV Family: R-7. Launch Vehicle: Soyuz-FG. Soyuz TMA-03M - . Call Sign: Antares. Crew: Kononenko, Kuipers, Pettit. Backup Crew: Hoshide, Malenchenko, Williams. Payload: Soyuz TMA s/n 703. Mass: 7,200 kg (15,800 lb). Nation: Russia. Program: ISS. Class: Manned. Type: Manned spacecraft. Flight: Soyuz TMA-03M. Spacecraft Bus: Soyuz. Spacecraft: Soyuz TMA. Duration: 192.79 days. Decay Date: 2012-07-01 . USAF Sat Cat: 38036 . COSPAR: 2011-078A. Apogee: 405 km (251 mi). Perigee: 375 km (233 mi). Inclination: 51.60 deg. Period: 92.40 min. Docked at the Rassvet module of the ISS at 15:19 GMT on 23 December. Undocked from the ISS on 1 July 2012 at 04:47 GMT and landed in Kazakhstan at 08:14 GMT..
2012 February 16 - . EVA ISS EO-30-1 - . Crew: Kononenko, Shkaplerov. EVA Duration: 0.26 days. Nation: Russia. Program: ISS. Flight: Soyuz TMA-03M. Relocated Strela 1 crane from Pirs module to Mini-Research Module 1 in preparation for undocking of Pirs docking compartment. Retrieved external materials exposure experiments..
2014 November 23 - . 21:01 GMT - . Launch Site: Baikonur. Launch Complex: Baikonur LC31. LV Family: R-7. Launch Vehicle: Soyuz-FG. Soyuz TMA-15M - . Call Sign: Astraeus. Crew: Cristoforetti, Shkaplerov, Virts. Backup Crew: Yui, Kononenko, Lindgren. Payload: Soyuz TMA s/n 715. Mass: 7,200 kg (15,800 lb). Nation: Russia. Program: ISS. Class: Manned. Type: Manned spacecraft. Flight: Soyuz TMA-15M. Spacecraft Bus: Soyuz. Spacecraft: Soyuz TMA. Duration: 199.70 days. Decay Date: 2015-06-11 . USAF Sat Cat: 40312 . COSPAR: 2014-074A. Apogee: 404 km (251 mi). Perigee: 399 km (247 mi). Inclination: 51.64 deg. Period: 92.59 min. Docked at the Rassvet module of the ISS at 02:49 GMT on 24 November 2014 with the crew of Shkaplerov, Virts, and Cristoforetti. Return was delayed over a month before the booster for the Soyuz TMA-16M crew could be cleared for flight following the third-stage explosion of the booster for Progress TMA-11M. Undocked on 11 June 2015 with the same crew at 10:20 GMT and then landed at 13:43 in Kazakhstan. 2015 July 22 - . 21:02 GMT - . Launch Site: Baikonur. Launch Complex: Baikonur LC1. LV Family: R-7. Launch Vehicle: Soyuz-FG. Soyuz TMA-17M - . Call Sign: Antares. Crew: Kononenko, Yui, Lindgren. Backup Crew: Kopra, Malenchenko, Peake. Return Crew: Kononenko, Yui, Lindgren. Payload: Soyuz TMA s/n 717. Mass: 7,200 kg (15,800 lb). Nation: Russia. Program: ISS. Class: Manned. Type: Manned spacecraft. Flight: Soyuz TMA-17M. Spacecraft Bus: Soyuz. Spacecraft: Soyuz TMA. Duration: 112.67 days. Decay Date: 2015-11-12 13:12:00 . USAF Sat Cat: 40744 . COSPAR: 2015-035A. Apogee: 406 km (252 mi). Perigee: 398 km (247 mi). Inclination: 51.65 deg. Period: 92.60 min. One solar panel of the Soyuz failed to deploy after launch. Docked with the Rassvet module of the ISS at 02:45 GMT on 22 July..
2018 June 6 - . 11:11 GMT - . Launch Site: Baikonur. Launch Complex: Baikonur LC1. LV Family: R-7. Launch Vehicle: Soyuz-FG. Soyuz MS-09 - . Call Sign: Altai. Crew: Prokopyev, Gerst, Aunon. Backup Crew: Kononenko, Saint-Jacques, McClain. Return Crew: Prokopyev, Gerst, Aunon. Payload: Soyuz 11F732A48 No. 739. Nation: Russia. Program: ISS. Class: Manned. Type: Manned spacecraft. Flight: Soyuz MS-09. Spacecraft Bus: Soyuz. Spacecraft: Soyuz MS. USAF Sat Cat: 43493 . COSPAR: 2018-051A. Apogee: 408 km (253 mi). Perigee: 401 km (249 mi). Inclination: 51.64 deg. Period: 92.66 min. See Soyuz-MS 09. ..
2018 October 11 - . 08:39 GMT - . Launch Site: Baikonur. Launch Complex: Baikonur LC1. LV Family: R-7. Launch Vehicle: Soyuz-FG. Soyuz MS-10 - . Call Sign: Burlak. Crew: Kononenko, Saint-Jacques, McClain. Backup Crew: Skvortsov, Parmitano, Morgan, Andrew. Nation: Russia. Program: ISS. Class: Manned. Type: Manned spacecraft. Flight: Soyuz MS-10. Spacecraft Bus: Soyuz. Spacecraft: Soyuz MS. COSPAR: 2018-F01. See Soyuz-MS 10. ..
2018 December 3 - . 11:30 GMT - . Launch Site: Baikonur. Launch Complex: Baikonur LC1. LV Family: R-7. Launch Vehicle: Soyuz-FG. Soyuz MS-11 - . Call Sign: Antares. Crew: Ovchinin, Hague. Backup Crew: Kononenko, Saint-Jacques. Return Crew: Ovchinin, Hague. Nation: Russia. Program: ISS. Class: Manned. Type: Manned spacecraft. Flight: Soyuz MS-11. Spacecraft Bus: Soyuz. Spacecraft: Soyuz MS. USAF Sat Cat: 43756 . COSPAR: 2018-098A. Apogee: 411 km (255 mi). Perigee: 404 km (251 mi). Inclination: 51.64 deg. Period: 92.71 min. See Soyuz-MS 11. ..
2018 December 11 - . EVA ISS VKD-46 - . Crew: Kononenko, Prokopyev. EVA Duration: 0.32 days. Nation: Russia. Program: ISS. The cosmonauts went outside to install a plug and thermal insulation on the�Soyuz MS-09�spacecraft which was damaged by a powertool causing an air leak. The cosmonauts gave Soyuz MS-09 a clean bill of health before they patched it up clearing the vessel for entry on December 20, 2018. Get ahead task included swapping experiments on the�Rassvet�module.